In response to Peter Dornauf’s editorial (April 17), the Tauranga Citizens’ Club executive, management, staff and members endeavour to welcome all our members, their guests, afﬁliated members and their guests into our club. The receptionist on duty on the day in question asked Mr Dornauf to remove his hat as our rules do not allow hats to be worn in the club room unless the hat is for a good reason eg medical, religious or for themes such as the Melbourne Cup. Mr Dornauf refused to remove his hat and the manager was then asked to come to the counter. The manager also asked him to remove his hat, he again refused and asked why he should, was again told that those are the rules and the club employs the staff to ensure the rules are upheld. If any of our people visited Mr Dornauf at his private residence (clubs are private) and were asked to remove their hat or shoes which could be part of their identity, they would not hesitate to do so as a show of respect to the hosts. The manager asked his partner if he wore his hat at their dinner table, she said no, but yet wished to wear it at ours. It is also obvious he gets strength from the presence of [Michael] Palin. Towards the end of our interview, Jones reaches out to grasp his hand, giving it a good squeeze. The pair hold hands for a couple of minutes, a gesture that perfectly reflects their 50 years of friendship – and its importance in sustaining Jones through his tribulations. Alexander was a brilliant and unconventional editor whose methods derived from Chinese Taoism: he achieved miracles while appearing to practise wu wei, or “do nothing”. In fact, Alexander operated instinctively, sniffing out writers whose style he liked and encouraging them, regardless of political viewpoint. The effect was to rescue an ailing publication and set it on a course of unwavering success. Those who credited him with setting the tone of the modern Spectator, of making it readable, irreverent and witty, were partly right. But the Spectator began to deviate from his liberal, civil open-mindedness only a few years after he stopped editing the magazine in 1984. This deviation took two, perhaps related routes. The first was a hardening of the paper’s political stance, first making it into a Tory organ (Alexander was never in his life a Tory) and then into a right-wing-of-the-Tory-party, brexiting rag. The second consisted of the introduction of a casual, jokey, faux-macho incivility – a malign mutation of Alexander’s irreverence – aimed at shocking the liberal bourgeoisie. Ludwig Wittgenstein once said that we cannot experience death because death is not an event in life. But then Wittgenstein never had to sit through this unbearable new film from Warren Beatty, his first in 15 years, co-written, produced and directed by its star, Warren Beatty, who may well be affecting a kind of kinship with his subject, the crazy but allegedly lovable billionaire recluse Howard Hughes. Beatty may also like the low lighting Hughes favoured. I’m on the phone to Prince’s first wife and I’m trying to picture the wrestling. He had a very strong upper body, Mayte Garcia says brightly – but she had very powerful legs. “When he knocked me down, I would take my legs around his body and squeeze really hard. So he stopped tackling me down to the floor.” She doesn’t know why they wrestled – couples do weird things, don’t they? Like the hypnosis. In her new book, she says she loved the hypnosis because it was the only time he’d let her talk without interrupting her. I used to like Jamie Oliver, or the idea of him. I liked his willingness to be a spokes-chef; to damn parents who feed their children Turkey Twizzlers and roof insulation; I liked that he is fat. Then I ate at Jamie’s Italian in Soho and met a plank resting on two tins of tomato paste bearing greasy salami and cold cheese, and steak frites that thought they were Italian, and I stopped liking him. I began to think him cynical and money-grubbing. There is a peculiar depravity to the mid-market family restaurant in central London that offers bad value through a good name, and I cannot forgive Jamie for pretending he was different; for pretending, as he ripped up basil with his bare hands and told men, yeah, you can cook, that he was my mate. (That is the evil of television. Fake intimacy.) The dish may have been called Jamie’s Plank, but I do not remember. I hope it was. It should have been, even if the plank was me. All of this goes to show that yes, airlines should probably not make data available through a barcode scanner that they don’t want to make available on a printed boarding pass. And yes, you are probably better off using an electronic boarding pass on your phone, inconvenient though it may sometimes be. But the biggest takeaway is simply that your personal data are a lot easier to hack than you probably think. A wide range of seemingly harmless slips of paper, containing your name and an identifying detail or two, can open you up to a hacker’s attack. So the next time you check for your personal belongings as you exit a plane, you might want to make sure your boarding pass is among them. At the Citizens Club I had to sign a register – odd in itself, I thought, but I conformed: Name, signature, place of origin. What more did they want? Fingerprints? A mouth swab? But then came an inexplicable request from the ageing receptionist. I was asked to remove my hat! Mockery ensued on Twitter, started by Elle Hunt and abetted by Ashleigh Young (“The funniest thing is how he buggered off and ‘drove back immediately to Hamilton’, thus expressing the full scope of his rage”), Toby Manhire (“A lot to like but I’m especially keen on all purpose par2 ‘The reason for these opening remarks will become apparent further into the text’.”), Giovanni Tiso and others. It is a very funny thread, turning that par 2 into a meme that rewrites the openings to Pride and Prejudice, Nineteen Eighty-Four and Star Wars. As always, spelling, punctuation, grammar and logic in the letters are exactly as printed in the Waikato Times. The punctuation (and associated spacing) in this batch is especially noteworthy. So Peter Dornauf (Monday, April 17) used up nearly half a page of the Waikato Times to tell us that he has bad manners and no respect for other people’s wishes. I was taught by my parents to remove my hat when entering a person’s house , church or any building that requested it. Also while serving in the royal navy anyone entering our mess would, as a courtesy, remove their cap, officers included, unless on official business rounds etc. It is also a rule of the RSA and the Australian RSL that you sign in and remove your hat, so maybe you should brush up on your manners in case you ever need to enter these establishments. What a brilliant and topical column on “Hat police” by Peter Dornauf this Easter Monday. The column being written by such a word-master as Dornauf was excellent of itself . . . yet it probably was also a metaphorical masterpiece to associate with the desperate anachronism still being perpetrated by some local authorities to prevent general commercial trading on “holy days” over the Easter holidays. The leaders of such councils pretend to pay homage to the fact that their duty as councillors is secular, and thus divorced from the imposing of religious dogma upon our secular society. They clutch at straws to maintain an almost clerical authority over our holidays, by claiming that the restrictions are to prevent the exploitation of “the workers”. The workers are protected by the common-law assumption that no employee can be penalised for not wishing to work on public holidays. If there is any doubt on that matter, it could be removed by a simple amendment to the Holidays Act. I guess that many would support what Mr Dornauf seems to be stating metaphorically on the matter, which is, “We are the pop culture of the new millennia . . . Beethoven’s Song of Joy and Onward Christian Soldiers, are not the anthems of secular councils” . . . nor should they be. For many years I have read Mr Dornauf’s column, often with pleasure. However, this morning’s column showed him to be pretentious, egotistical, self-centred and just plain ill-mannered and rude. Who does he think he is to DEMAND to wear his hat indoors? Maybe I’m a few years older than him BUT a gentleman always removes his hat on entering any premise, maybe their were no “ladies” present but does that give him cause to be so uncouth? Perhaps his self-importance is such that he thinks he should ride rough-shod over the minions at the club/restaurant! I am so pleased he left — what a thoroughly objectionable person to have to eat with! It must have been a sad and slow day in Peter Dornauf’s world that he manages to dedicate 14 paragraphs of a 17-paragraph editorial to his moral outrage about having to follow a couple of minor rules. It appears the crux of the matter was not being allowed to wear his fedora, “which has become part of my identity “, all a bit vainglorious methinks. He states: “I am a grown man, no longer six years old and nobody tells me what to wear any longer” (actually states this twice), so clearly does not drive a car (wear your seatbelt), nor drives a bicycle or motorcycle (wear your safety helmet) or works in an environment where the wearing of personal protection equipment is a necessity. So here is Etta James performing Randy Newman’s “You Can Keep Your Hat On” at the 1991 Newport Jazz Festival. Son Craig noted at his funeral that a young Barry would spend long hours at Mt Albert Grammar being forced to rewrite assignments. He certainly took his own advice, perhaps most memorably, when the Adult Adoption Information Bill passed into law in 1985. The law allowed parents who had put children up for adoption to veto any later request as to their identities. Barry, whose wife Tricia was adopted and never able to trace her birth father, felt strongly on the issue. Each year for more than 20 years he wrote a personal letter to every politician deploring the veto, finally giving up in 2008 on Tricia’s death. On a second occasion, he certainly went further than most in questioning those in power. Invited to make a video link submission to a parliamentary select committee on replacing the Privy Council, Barry was taken aback, at the start of his submission, by what he perceived to be three or four committee members nodding off. Not wanting to waste his allocated 15 minutes, he demanded they all stand up and wave their hands. The startled chairperson took exception, but Barry said he would name those asleep. They all stood and waved. My brother once organised a talk and book signing with left-wing journalist and documentary maker John Pilger at Waterstones back in the late 90s. Last I heard he was hanging out with Julian Assange. My brother got a job with Amazon and that branch of Waterstones has closed down. The second insight is that while international trade seems to involve competing with foreigners, it’s often more illuminating to see it as a battle between domestic producers. My home town of Oxford makes Minis, which we can export in exchange for camembert. But what if a post-Brexit government decides to hammer the camembert trade? It’s not impossible: cabinet minister Liz Truss did once describe the UK’s reliance on foreign cheese as a “disgrace”. There are two ways to make cheese in the UK: the obvious way, using cows, and the indirect way, by making cars and then trading the cars in exchange for cheese. The British cheese industry is, in a very real sense, directly competing with the British car industry. Protect one with a tariff, and you hurt the other. Around the farmstead itself is a high security electric fence with thousands of volts pulsing through it. I’ve seen a baboon climb over it — and I know a leopard got through it one night — but unless the wires are cut there is no way a human can breach the line without triggering loud alarms and flashing lights. The first alarm goes off at about 9 p.m. I go out with the fencing team until we find the cut wires, fix them and restore power. We have an askari defending the barn, where our last hay reserves are stored for the farm’s cattle. It’s just a matter of time before the invaders try to either steal it or burn the barn out of spite. At midnight the alarm goes off again. Wandering along the fence line in the dark with the team, the hairs on my neck stand up. People outside the fence are watching us and I wonder what arms they carry and if they will use them. The cut is found and fixed. At 2 a.m. the alarm sounds again — and then again at 4 a.m. In our capital city one is able at times to see a lock of hair; the shawl that covered a coffin; the typewriter; the manuscripts with their lines of text like distant tangled wire. (An image I draw from her childhood in Karori.) So what a deft mayoral instinct this seems to be – we must own the bones. Are our corporeal remains no more than our pure water, to be given free to foreigners? Yet the recumbent, a niggler says, didn’t she choose France as where she preferred to live? Ah yes, the mayor says, to live! He has us there! But who would prefer to lie, forever, near rackety Versailles, when Wellington is still on offer? Poets to the left of me, versifiers to the right. Here, at Open Culture, is TS Eliot reading The Waste Land and The Love Song of Alfred J. Prufrock. Hard to tell that he was from St Louis, Missouri. Fun fact: he wrote Prufrock, possibly the most middle-aged poem ever, when he was 22. Adjustments would be few and easy. Canada’s provinces have wide powers and by treaty the UK’s could be even broader. The queen would remain head of state. As a provincial flag, the Union flag would still be flown, with the Canadian flag a discreet presence on government buildings. Possibly true – Miss 13 plays “Smoke on the Water” on it, which does make me laugh. So here is the Wellington International Ukulele Orchestra, Bret McKenzie on vocals, with Randy Newman’s “Short People”. When this record came out I had a girlfriend who was 1.82 m tall. She thought the song was hilarious. 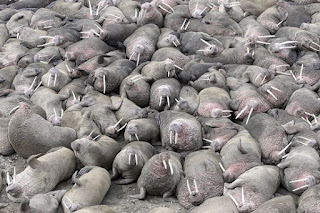 This photograph by Rick Beldegreen “was taken from a bluff overlooking several thousand walrus on a beach along the Aleutian Peninsula on the Bering Sea in Alaska. I was lying on my belly looking straight down on the herd.” Via Mick Hartley.